Marvel’s attempt to recreate its interconnected universe on film has officially paid off. “Iron Man 3″ is a lot more organized than its predecessor, and a lot less cheesy than its predecessor. If anything, “Iron Man 3″ is cheesy on purpose. While the director/writer team of Jon Favreau and Justin Theroux that made up “Iron Man 2″ is certainly a talented one, Shane Black brings back everything that was great about the original “Iron Man,” plus everything that makes his take on the action genre so unique. “Iron Man 3″ begins with a confession and then a flashback to 1999. During that time, Tony Stark (Robert Downey Jr.) is still the same womanizing, partying genius, except with a better heart. The key information here is that brilliant scientist Maya Hansen (Rebecca Hall) and her boss Aldrich Killian (Guy Pearce) work on a special experiment that could eventually help humans grow body parts back. It is a nice touch for the third “Iron Man” movie, as this series explores people using technology to exceed their life expectancy. For further proof of that, look no further than Tony Stark. In “Iron Man 2,” he was dying. 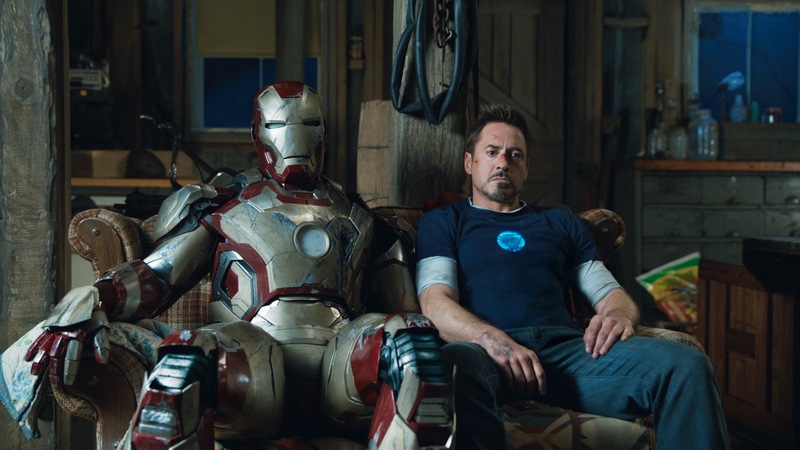 In “Iron Man 3,” he comes back with post-New York anxiety. Not the Woody Allen kind, but rather the kind you get from fighting aliens that nearly destroy an entire city. Tony distracts himself with work and a serious relationship with Pepper Potts (Gwyneth Paltrow), but mainly work. This still doesn’t stop him from waking up with PTSD nightmares. The “Iron Man” series is typically a lot more lighthearted than other films adapted from comic books. Yet, it still manages to be a serious character study of Tony Stark, who is basically the living embodiment of an adrenaline rush. “Iron Man 3″ portrayed a man bound to the machine that also haunts him. Tony’s state of trauma can’t last too long: like any hero, he must get back to work. His latest challenge is a terrorist named The Mandarin (Ben Kingsley), who looks like Bin Laden but talks like a member of Blue Collar Comedy. The Mandarin is vaguely threatening yet threatening enough that Tony extends an open invitation for The Mandarin to come attack him at his own home. Needless to say, this doesn’t turn out too pretty. The action and CGI in this film are phenomenal, yet the best part of “Iron Man 3″ is when Shane Black strips Tony of his super powers and in effect, his identity. Technology can sometimes be used as a crutch, so it’s a treat to see Tony use nothing but his wits to fight his enemies. It is a reminder of why Tony Stark is a great hero in the first place: he is a genius. The power of the iron man suit seems to be transferrable However, Tony Stark is one of a kind. The reason that “Iron Man 3″ is so entertaining is because it’s a serious story that never takes itself too seriously. Shane Black plays action movie cliches for comic relief all while creating a very solid action film. No stone is left unturned here, if an item is brought up earlier in the script, you can bet it’ll come back later on. “Iron Man 3″ is also the rare action film that doesn’t think its audience is dumb. Most of the time, the audience gets to find out plot details at the same time that the characters do. Therefore, the audience is not smarter than the characters, and the characters are not smarter than the audience. Both plot and character details unfold slowly. Though not quite on their level, it reminded me of some of the best action genre made in the 1980s, and not just because it also took place on Christmas. “Iron Man 3″ is not perfect. Many loyal (beyond the movies) “Iron Man” fans were unhappy with a certain plot twist. As somebody who can only be credited as seeing the movies, I can understand why, but it was certainly an interesting experiment. My one quibble about the film is that it is at first bogged down by “Avengers” references. Once it learns to balance those with new plot points, it really takes off. This may be the final “Iron Man” film. If so, it closed out well because it improved so much from its predecessor and revived the intrigue behind the Iron Man and Tony Stark. Tony Stark is more a Hollywood than New York hero, as he is a man driven mainly by the ego propelled by his talent. “Iron Man 3″ is also all about characters putting on different masks, labeling things, and overall trying to put on a good performance for the rest of the world. Yes, the name Iron Patriot means a lot. In terms of performance, there could have been no better Tony Stark than Robert Downey Jr., who’s fast-talking performance so perfectly matched the wit of what was written down on the page. Basically, Robert he created an alter ego just as compelling as the hero he must play. The 3D Experience: Definitely worth seeing in theaters, but you could do without the 3D. Sidenote: During the 1999 flashback, Jon Favreau’s hairstyle and outfit is nearly identical to that of John Travolta in “Pulp Fiction.” Intentional? This entry was posted in Ben Kingsley, Guy Pearce, Gwyneth Paltrow, Iron Man, Iron Man 3, Jon Favreau, Movie Review, Robert Downey Jr., Shane Black on May 7, 2013 by ian0592.